Symbiosis Distance Learning MBA 2019: Symbiosis (SCDL) is a leading distance learning autonomous institute in India located in Pune (Main Office), Bangalore, Nasik & Noida. The institute is known for its distance learning MBA (PGDBA) program. Since Symbiosis Centre For Distance Learning (SCDL) is not a university, it only offers diploma courses. The Post Graduate Diploma in Business Administration (PGDBA) offered by SCDL is considered to be equivalent to an MBA program and it is quite popular among working professionals too. Apart from its popular PGDBA (Distance Learning MBA) program, the institute also runs various Postgraduate, Diploma & Certificate programs under distance education mode. In this article, you'll find information about Symbiosis distance learning MBA which includes SCDL MBA admission procedure, fee structure, eligibility criteria and various other frequently asked questions will also be answered here. You'll also get to know about various MBA specialization that Symbiosis offers with its distance learning MBA programme. So without wasting any more time, let's dive into the SCDL PGDBA program. Symbiosis is a top-notch distance education institute in India started in 2001 and offers a Post Graduate Diploma in Business Administration (PGDBA) which is specially designed for people who want to excel in their professional life. It is a 2 years distance learning program which is divided into 4 semesters. The curriculum of the course is designed by industry professionals and prominent academicians and it is based on the real business case studies. The details of Distance Learning MBA program offered by SCDL is as follows. Candidate must be a graduate in any discipline from a recognized university. International/SAARC students having a graduation degree from a recognized/accredited University/ Institution can also apply. Graduation Final year students who are awaiting their results can also apply. Although these students need to complete their bachelor's degree within the given time period of SCDL. The total duration of the SCDL PGDBA program is 2 years. Although the registration is valid for 4 academic years. There are total of 4 semesters in distance education MBA program offered by Symbiosis. The first two semesters focus on core modules. In the 3rd semester, students can choose their specialization. students can choose two electives, from list specializations. We've already written a long post about the fee structure of various courses offered by SCDL. you can check MBA Fee Structure. There are two types of fees that students need to pay to SCDL for taking admission. Students have two options to pay their fee. They can either pay the full fee in advance or they can opt for the installment mode of payment. The fee structure of Symbiosis distance learning MBA (PGDBA) is as follows. Students are required to pay the examination fee extra as per their attempts. The fee can be paid online or through demand draft. To make the payment using demand draft, students need to make demand draft in favor of "The Director, SCDL, Pune" payable at Pune. Purchase the prospectus and application form from SCDL Campuses, SCDL Associates, Selected HDFC Banks, and through SCDL website for Rs 1500/-. Submit the form with the required document at SCDL Campuses and SCDL Information Centers. You can also courier the same to SCDL Pune Campus. Submit Full Fee or First Installment Payment along with the Registration Form. If you're an international student seeking admission into Symbiosis Distance Learning MBA program, you may refer to the following post. for more details refer SCDL website & prospectus. Apart from Distance Learning MBA, Symbiosis also offer 19 other different courses. These distance learning courses include various PG Diploma, Diploma & Certification courses. To know more about these courses you may visit our following post. Below is the list of some industry-specific post-graduate diploma courses offered by SCDL. 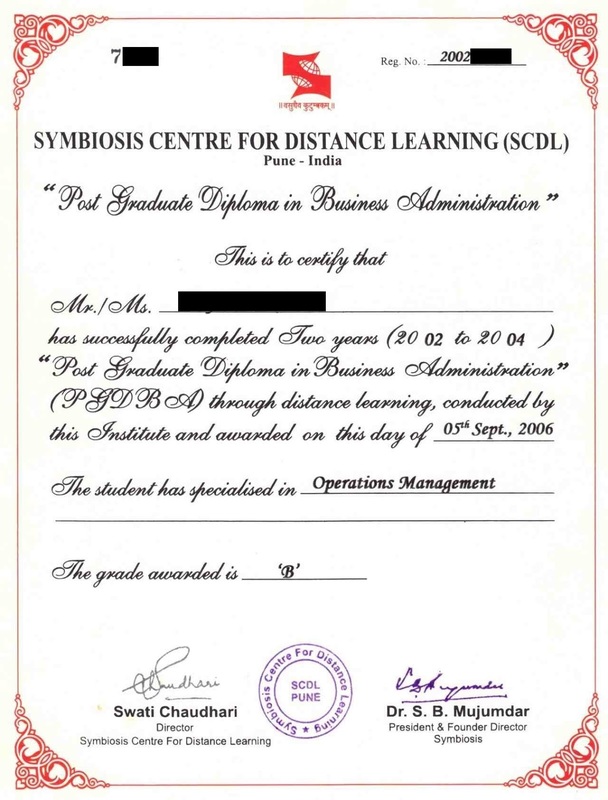 Below is a sample certificate that SCDL provides to their students after completing the course. Question: Do students required to appear in an entrance test to get admission in Symbiosis Distance Learning MBA? Answer: Yes, Students are required to appear in SCDL PGDBA entrance test for getting an admission. Question: Is SCDL approved by UGC? Answer: All universities and institutions offering distance education in India are required to get an prior approval from UGC DEB to offer distance education courses in India. SCDL has an approval to offer these courses from UGC. Although we advise that you should check UGC DEB website for the recent update on SCDL approval. Question: Is PGDM or PGDBA is equavalant to MBA? Answer: Syllabus wise both PGDM and MBA are almost the same. Both the courses give you the similar kind of knowledge about business management. The major difference between the two is, a PGDM is a diploma course while MBA is a degree program. Both the courses are equally accepted in the corporate world. Question: Can I do a PHD after PGDM? Answer: No, You can not do PHD after PGDM. You need an MBA degree for doing your PHD. To read a review about SCDL or know what Symbiosis Students Says about their Distance MBA Course you may visit the corresponding links.